Like many things in life—ice cream flavors, Netflix shows, and so on—you have quite the selection when it comes to denim. You can either go for skinnies, wide leg, girlfriend, boyfriend, culottes, etc. Then there’s the variety of washes—in between dark and light, for example. Finally, the range of brands—so many to pick from. To be honest, we can’t really pick a favorite, but there are specific lines and styles some of our favorite fashion A-listers gravitate toward. To fill you in and give you inspiration, we tapped celebrities Jamie Chung, Olivia Culpo, Jaime King, and Jessica Biel to spill on the denim labels that work best for them. FYI, we’re so on board with their picks—and many of our editors religiously wear these brands. Keep scrolling to check out their answers and catch a glimpse of some gorgeous street style shots of each in cool denim. Plus, go a bit further to shop other jeans we’re loving right now. On Olivia Culpo: Victoria Beckham Culotte Jeans ($364); Fallon Andalusia Lace Choker ($98); Tod’s bag; Calvin Rucker FWRD Exclusive Truth Is Top ($225); Robert Clergerie Amina Mules ($292). On Jamie Chung: Maje Basalt Suede Biker Jacket ($606). On Jessica Biel: Chanel flats. On Jaime King: Wolford bodysuit. 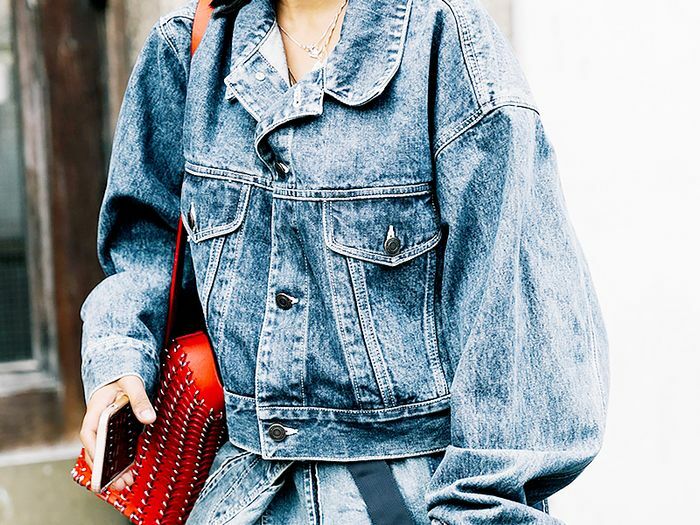 Are We Going to Start Wearing This Denim Trend Again? Kendall Jenner and Bella Hadid love these. Try these with a gorgeous pair of heels for casual Friday. These jeans are actually two-tone if you turn to the side. These look way more expensive than $40. These would look so great with a crisp button-down and heels. A fresh spin on raw-hem denim for fall. You can’t go wrong with a classic pair of black skinnies. This is the It silhouette of the season. We’d pair these with a white tee and a cute pair of ballet flats. These flares are incredibly flattering. What’s your favorite denim brand? We want to know. Let us know in the comments below!